Earnings of listed companies have been up 4% in the Second Quarter and 11% for the 12 months despite challenging times. According to broking firm CTCLSA, market earnings in 2Q2018 grew +4% by Rs. 50.25 billion as against Rs. 48.236 billion a year earlier. However the 2Q2018 figure is lower compared with the Rs. 74.69 billion achieved in 1Q and Rs. 79.6 billion posted in 4Q of 2017. In 2Q2018, earnings were driven by the Banks Finance and Insurance (BFI), Beverage Food and Tobacco (BFT), Telecommunications (TEL) and Power and Energy (PE) sectors. “Earnings growth was however somewhat offset by weak earnings in Diversified Holdings (DH), Manufacturing (MAN) and Plantations (PLN), and losses in the Hotels & Travel and Construction & Engineering (CE) sectors,” CTCLSA said. Banks Finance and Insurance firms saw their earnings gain 22% YoY (59% of 2Q2018 total earnings, 29% of total market cap), driven by Licensed Commercial Banks (LCBs) and Insurance Companies on account of improved core banking and insurance income. The telecommunications sector reported a +33% YoY gain (9% of 2Q2018 total earnings, 5% of total market cap), driven by revenue growth witnessed with the removal of the telco data levy. According to the Trailing Twelve Months (TTM), market earnings increased +11% YoY to Rs. 251.7 billion largely due to strong earnings in Banks Finance and Insurance, Beverage Food and Tobacco, Telecoms and Diversified Holdings despite the losses in the Construction and Engineering and Manufacturing sectors. CTCLSA also said the Colombo Stock Exchange (CSE) had witnessed a market decline, with the All Share Index (ASPI) falling -6% in 2018YTD (as at 30 August 2018). 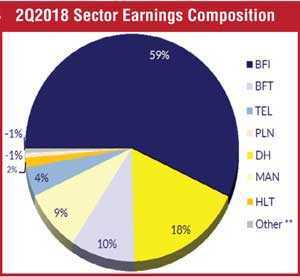 In terms of sector index performance, the BFT sector witnessed positive movement, increasing +7% YTD, whilst the CE, MAN, PLN and PE sector indexes declined -39% YTD, -25% YTD, -24% YTD and -11% YTD respectively. Current TTM market PER stands at 10.5X and CTCLSA forecasts forward market PER at 9.6X by end-2018, supported by YoY total market earnings growth of +12% YoY.